I have this new mission in life. Ok, it’s less of a mission and more of a plan that I need to stick to: Using my dehydrator at least once a week (which I received back in May for my birthday because I request the wildest of gifts). Especially since taking my raw chef course, it’s more clear how awesome dehydrating is and why I will become a rockstar with it…the more I use it. This is where the kale chips enter in. I used to be a habitual oven kale chip maker. The type that you bake at 350F for 10-15 minutes but they just never taste as good as the ones you have from a dehydrator (but don’t worry - you can still make these with your oven if you don’t own a dehydrator!). Dehydrating makes them evenly crispy and delicious. I knew it was only a matter of time since getting my dehydrator that kale chips would be on the menu. Then randomly one day, I knew I had to make cheesy kale chips. Regular kale chips are good and all, but when you add that “cheese” element, it’s like being in a whole new ballgame. 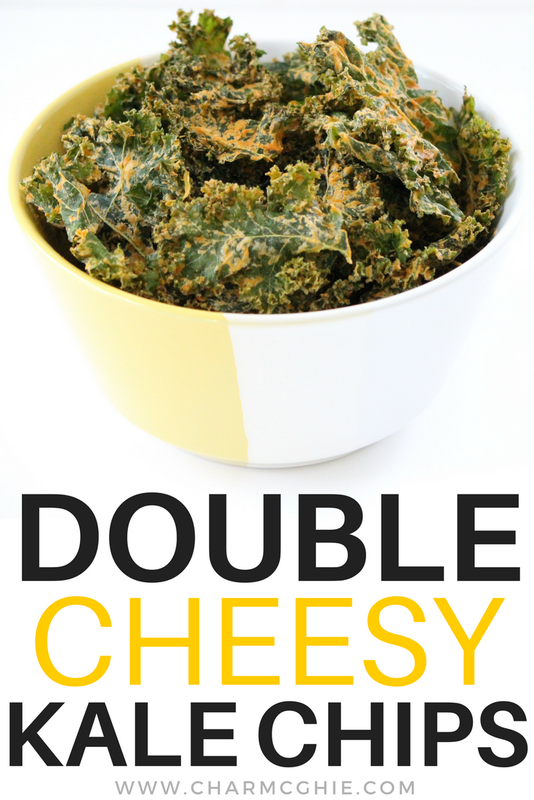 So join me below as I show you how to make not single, but a double cheesy sauce for your next batch of kale chips! These are not single, but double cheesy kale chips because the recipe contains TWO "cheesing" agents that I think are necessary. Enjoy! In a large bowl, place torn up kale into. Use 3/4 cup to 1 cup of sauce and add to the kale. Mix together and then use your hands to “massage” the kale and really get it incorporated with each piece of kale. Dehydrate for 6 hours at 110F. OR, bake in the oven at 350F for 10-15mins.You could also put your oven on the lowest setting (mine goes down to 170F) and back for 1-2 hours. Leave oven door ajar to further reduce heat. Or, download the pretty PDF version here!